Discussion in 'Portable Headphone Amps' started by immtbiker, Apr 3, 2010. Question? How do you take a portable, semi-small rectangular box that weighs less than eight ounces, stores and outputs music of various types of file extensions, and then, takes the music and makes it sound superior than just using the built-in headphone jack? Answer: A brand new innovation from Ray Samuels Audio. Anyone that knows portable audio, has, or knows someone who has a portable amp designed and built by Ray. Ray not only designs each of his amps from scratch (sometimes they get their start on a lunch tray), but he personally chooses and orders all of the components that go into his designs down to the volume controls and each and every electron/current carrying piece of electronics. Ray puts his hands on every single amp he makes and sells and inspects each one that leaves his shop before they end up in the end user’s hands and ears. For example, he throws out a large percentage of the volume controls that he purchases, testing every single one, for channel imbalances and other minuscule imperfections. Only the ones that are perfect make it into a box that bears his name. The rest end up living the rest of their lives at the local garbage dump. Looking at the inside of each of his chassis closely resembles and reminds me of a well-oiled, highly groomed military procession. With all of the tiny and mid-sized components all standing at attention in perfectly lined rows, columns and areas of organization that scream out “attention to detail”! Ray started making portable amps in 2001, and each new design that has been introduced since then, have become smaller, more efficient, sound a little better, and have had some new technology to warrant adding it to the RSA line-up. From 9 volt disposables to built in rechargeable power cells to lithium technology. At a time when his competitors were offering 6-8 hour battery life, RSA was offering 50 hours. Now he claims his newer builds can be played for 8 hours a day for 8 days. His amps have enough power for a weeklong trip without having to recharge. A few years ago RSA offered a portable amp/dac combination named “The Predator” that changed the moveable music world, making it possible to use laptop computers as a source, for on-the-go lossless playback, that gave home CD players a run for their money. From that point on, Ray’s amps continued to get smaller, offering more features (gain switches), chassis color options and power with light indicating on/off switches. What more could a designer invent that would be new, un-chartered territory, while still being able to make amps that already were some of the best sounding amps in the industry? For the last 5 or so years, the headphone amp industry has been improving by leaps and bounds. They have been joining home audio balanced components by creating balanced headphone amps with both balanced inputs and outputs, and the small niche, or demographic of headphone audiophiles have been buying up these amps in droves along with a new breed of DIY (do it yourself) and professional cable makers cropping up, re-terminating already great headphones into tremendously great balanced headphones and their associated cables. What was missing? What else could be innovated to take portable music listening to the next generation? Any smaller and we might as well have the amps imbedded in our ear canals (although, don’t rule out the possibility of even smaller amps in the years to follow). The Ray Samuels Audio “Protector” is a brand new design, incorporating all of Ray’s designs leading up to modern day, with the addition of a 4-pin balanced headphone output, which will take any single-ended input and, utilizing a circuit design created by RSA which then converts the signal to a balanced one, and with the use of a re-terminated balanced headphone cable, offers all of the benefits of balanced sound in a portable package. There is still a single ended output jack for those who wish to use the amp in that mode. Without giving away the company’s secrets, this is achieved by taking a single-ended signal and turning it into a balanced signal. RSA recommends between 100 and 200 hours of “burn-in” time to achieve the best sound quality and offers a lifetime warranty, which is transferable to multiple owners, so there is no risk of failure, even if you sell the amp to other people. Not too many audio manufacturers offer this option. -The Protector uses two “state of the art” chips, with true full-differential input/differential output, with the lowest spec’d input noise of 1nV, and 150MHz bandwidth. -Charging: Universal charger with LED indicating full charge. The first time I had the pleasure of trying out the Protector, was at this March’s NYC Spring Head-Fi Meet. At first I wasn’t really interested, because even though I have some decent equipment of my own at home, and get to demo some really cool hi-end equipment, I’ve only owned components with balanced outputs or inputs, but nothing Headphone related. My balanced experiences have been limited to electrostatic setups, and my Luxman P-1 hooked up to my Meridian G08 but the headphone output of the Luxman is single-ended. Also, I did a review for Tone Audio on a balanced pair of AKG 701’s using Headroom’s balanced Desktop Amp. The first thing that I got to use was a pair of balanced Sennheiser HD600’s that Ray personally rewired, with an adapter that is XLR on one side and then the 4 pin connector that is the counterpart to the port that is built into the Protector amp. I have owned a pair of HD600’s since 2001, when they were the top headphones to have, along with the new Grado RS-1’s, and never really totally enjoyed them. They have a midrange darkness that has always bothered me. So even though I was hesitant, Ray handed them to me with a silly smile on his face, and I chose one of my Reference CD’s: Patricia Barber’s “A Fortnight in France” and dialed in track 9 “Whiteworld”. I was completely blown away. The sound that I was hearing was coming from the Senns and the little tiny box that fit in the palm of my hand? Not possible. But it was. The percussion came at me as if I was sitting right in front row center, and the reverb in Patricia’s vocals and the bass lines and rhythm guitar was one of the best presentations that I have ever heard. The midrange was exactly where I wanted it to be, and it sounded more like my R-10’s and T-1’s. I figured it was just a fluke, and inserted another one of my “go-to” discs when critically evaluating equipment, not just for average listening. It was David Sanborn’s “Inside”. David is a stickler for making top-notch recordings. He even lists all of the state-of-the-art equipment he uses to make his recordings. I chose three different songs, one of them being Bill Wither’s “Ain’t No Sunshine” which is performed by David Sanborn and his Band with Sting on vocals. Anyone who knows and listens to Sting, knows that he has one of the most unique voices around. I’ve seen Sting live twice, once when he was the lead singer with “The Police” and once, with his own band, and this was as close to what he sounds like real, as real gets. I asked Ray to lend me his Protector, which happens to be his own personal one, with a lot of hours on them. I own a beautiful pair of JH-13’s and UE-10’s and I had Craig from Whiplash Audio (extremely great person and vendor, as well), make me a pair of his wonderful TWag wired IEM cables. They are the best cables I’ve heard for my IEM’s and they reveal every detail you could imagine in a recording, good or bad. Craig had bought a bunch of balanced connectors from Ray and re-terminated them with the 4 pin balanced connector needed for use with the Protector in balanced mode. I obtained a cable so that I could evaluate the Protector with my JH-13’s in balanced mode (the JH-13 cable is user replaceable at the IEM end) in the quiet and solitude of my own home. I have used every source I could throw at it, from my iPod Nano playing Apple lossless, to my Transporter playing flac files, to my Esoteric DV-50 playing SACD (downsampled to PCM output), to my HiFiMAN HM-801 playing 24bit 96 kHz hi res files downloaded from David Chesky’s site, HD Tracks. This amp is unbelievable. I also used the single end output, but in truth, I have enough portable amps that are single ended, I really didn’t want to waste precious time listening to anything other than balanced. I rotated in a generous portion of genres, including Jazz, Classical, traditional Jazz, classic Rock and Modern Rock fusion. I have found that with the Protector, the JH-13’s, and the TWag IEM converted cable, that bad, overly compressed recordings, like classic rock, is unbearable to listen to. The music is just one giant mess of instruments all stepping on each other. With modern and traditional Jazz, the sound reproduction is beyond belief. The head stage and the air and separation around the instruments is something to be heard. The JH-13’s aren’t a particularly “bassy” in-ear, but the bass is satisfactory, and with the Protector in balanced mode, there is a subsonic feel to the bass. Listening to Hot Tuna’s, “Live at Sweetwaters”, Jack Cassidy’s bass lines and “finger over fret” sounds are so clean, I truly got chills. You can hear the round wound strings growl. It brought back images and memories of my youth, which is one of the joys that listening to music currently, has the potential to do for me. When I reach that point, which is my audio nirvana that is the dose that I am looking to be served. Unfortunately, it doesn’t happen as often as I wish it would. Most of the past RSA amps in the last 4 years have had that Ray Samuels house sound, which you either love, or you don’t. 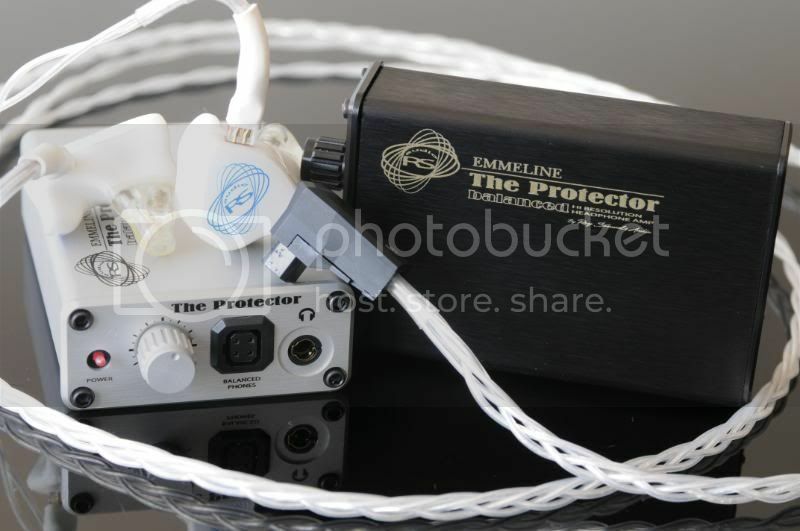 The Protector is an entirely different sound, which brings out the best that a headphone and a recording has to offer, and it doesn’t seem to care whether or not you are using a headphone with 32 ohms of load with poor sensitivity, or a 300-600 ohm headphone with over 90 dB’s of sensitivity. How does all of that great sound come out of that little box? To me, it doesn’t really matter, as long as it does. Music is my recreational drug…I need a dose of it everyday! If I had the money, I would have ordered one the first day I heard it. How does a JH13 driven single ended by a mid-high home amp (Woo6 or higher) compare to balanced protector drive? Better, sameish, slightly lower? Nice review. During my brief time with the Protector, I felt pretty much the same way. Mighty impressive little amp. I am slightly interested in this unit because it's different. I've been disappointed with every portable amplifier I've listened to, up to and including the LISA III. I'm upset that I was unable to attend the NYC meet but hopefully I'll be able to borrow a balanced JH cable and try this thing out during an east coast meet in the future. I don't see myself purchasing it unless it has something to offer against good single-ended desktop offerings, though. Nice review, especially with history on RSA portable amps. Great review immtbiker, im loving mine with balanced TWag Jh-13's as well coming out of my dac19, ive never heard music sound this good. not much into portables, but this new rsa amp sounds real interesting. thanks for the review. So did you like it? Tell us how you really feel. The rest of My Signature Is In My Profile!!! I accept free CDs and equipment ... Just mail them to me! Nice review. You beat me to it, so maybe I don't need to review it too? I think the Protector is tuned perfectly for my balanced HD600. Like you said it does bring the mids and vocals alive, with good impact and sparkle to go along with that. It's also my favorite portable amp for my UE11Pro, which show a huge improvement when driven balanced off the Protector, with no boomy or slurred bass or recessed mids. However, I've been spending most of my time listening to my JH13Pro balanced off the Protector, as I get just a little more detail and speed from those vs the UE11Pro. I'm waiting for a spare cable for my HE-5, and then I'l re-terminate those and try them on the Protector in balanced mode like Skylab recommended. In single ended mode the HE-5 are just too difficult to drive properly with it. 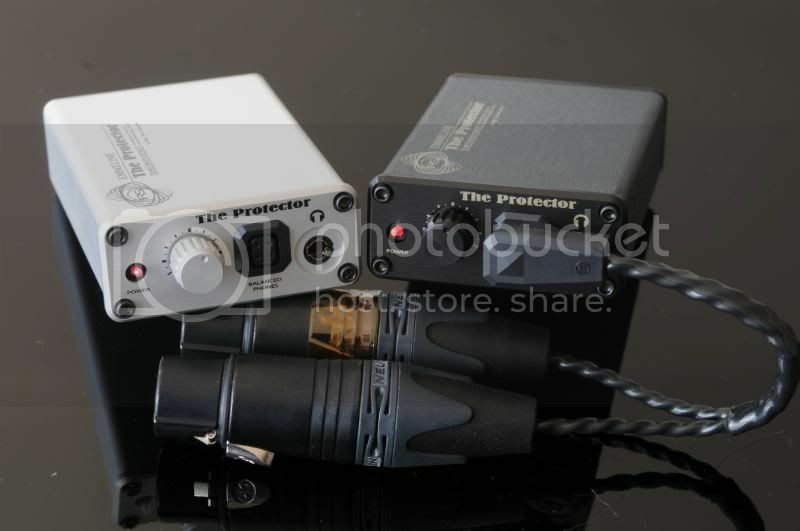 Sure looks like Ray have succeeded with the Protector, making it a really great amplifier in a small package. Great review, thanks a lot for the priceless impressions. An Audio Purist Would Always Be An Audiophile! Thanks for taking the time to go into your personal interaction with the Protector. It is amazing how the music can trigger such memories of our youth. Very well thought out and written review. I couldn't agree more with your findings.